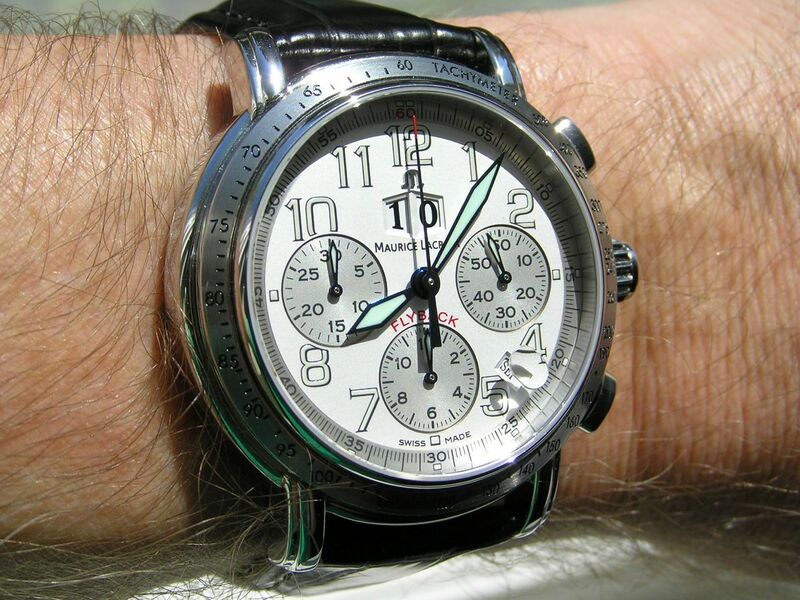 Maurice Lacroix makes some mighty impressive watches. The company takes high horology to some interesting places, with a variety of complicated watches featuring moon phases, dual time displays, great movement finishing, chronographs and much more. 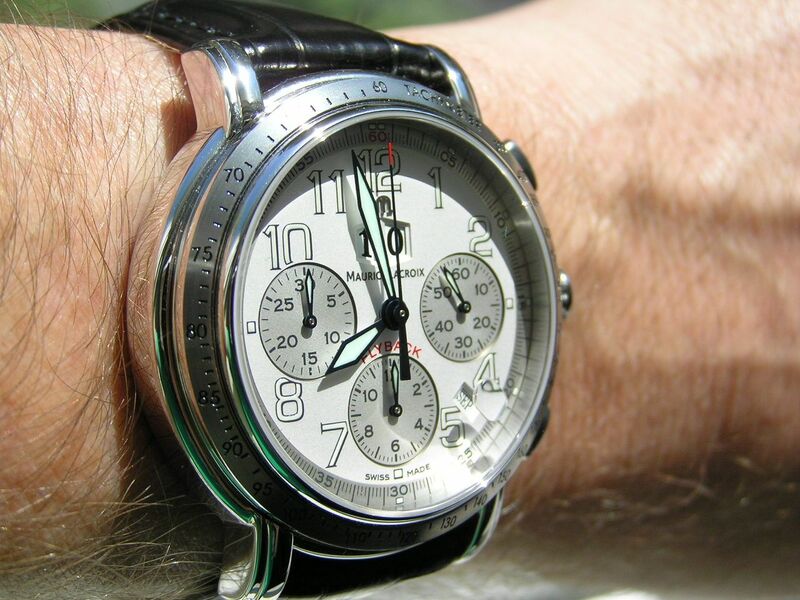 The most fascinating part of all this is that many times, you can find Maurice Lacroix watches heavily discounted, which makes them an exceptional value and a must-have for any collection. 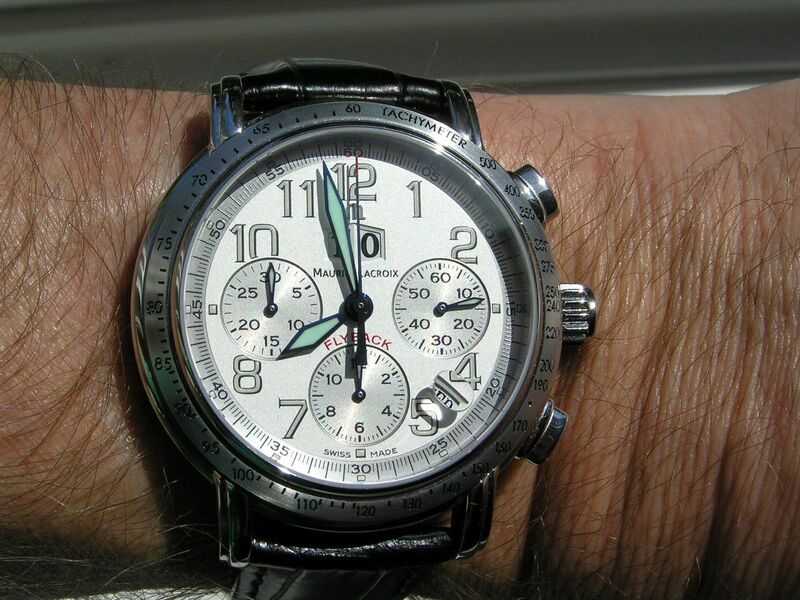 The Maurice Lacroix (‘ML’ for short) Masterpiece Flyback Aviator reviewed here is a prime example of the complicated watches the company produces. 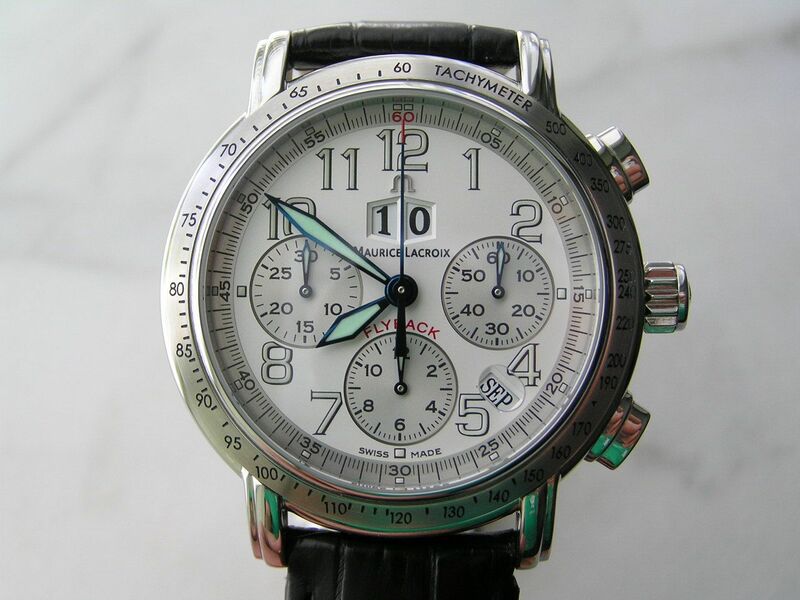 This watch of course tells the time, but also features a flyback chronograph. 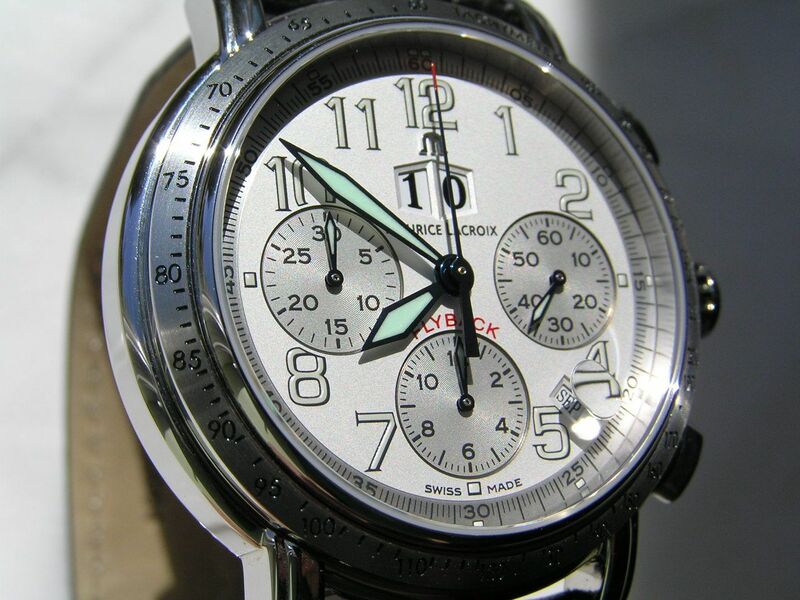 A flyback mechanism in a chronograph allows the user to reset the chronograph timing back to zero with one push of the reset button, instead of first having to stop the chronograph and then hit the reset button. I have to admit that it is a bit disconcerting at first to have the chrono running and be able to push the reset pusher and not have anything bad happen to the watch, but you get used to it and really start enjoying the flyback feature. With the flyback function, you can also hold the reset button, which resets the chrono to zero and keeps it there until you release the reset button. Useful in certain timing applications. In addition to having a flyback chrono, this watch also features a big date display and a month display, which conspire to create an annual calendar. If you were to wear this watch everyday for a year, you would only have to reset the date once, at the end of February. In all the other months, the date self-adjusts for 30 or 31 day months. Pretty slick. The only thing better is a perpetual calendar, which does not need resetting at all during the course of a year, but a real perpetual calendar watch costs many, many thousands of dollars. 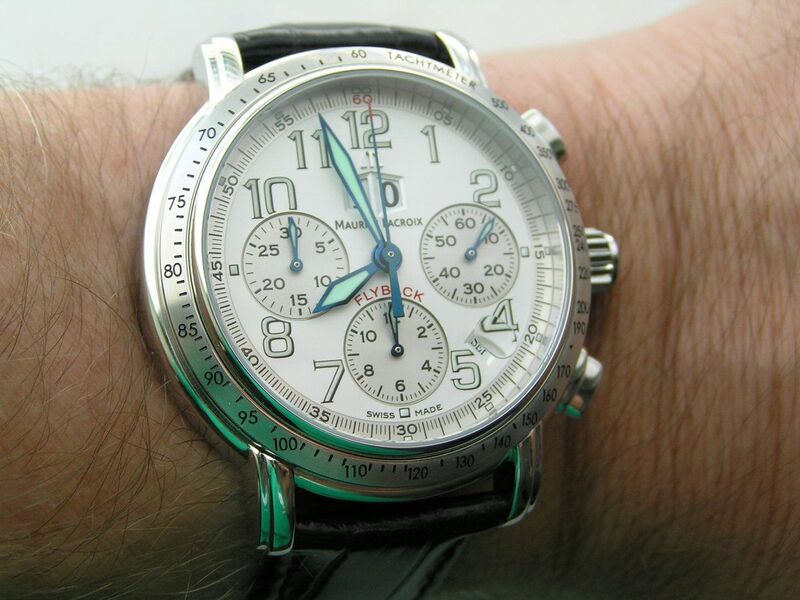 To be able to have a watch that combines a flyback chronograph with an annual calendar as this ML does and be able to acquire it at a very modest cost makes this watch that much more special. This watch currently holds the title of the most complicated watch in my collection. This is quite an impressive list and assures the buyer that an ML Masterpiece watch is a very special timepiece. What attracted me to this particular ML model, aside from its unique feature set, is the way ML has managed to infuse a slightly dressy watch with enough sporting design elements to make it a great all-around watch. It’s not too fussy, not too casual and oozes quality. It’s a very clean design that is easy to read and easy to wear. Nice job! The ML Flyback Aviator starts with a fully polished all stainless steel case that measures 41.7mm without the signed, screwdown crown; 46.2mm crown inclusive. Lug width is 20mm, case thickness is 13.5mm. 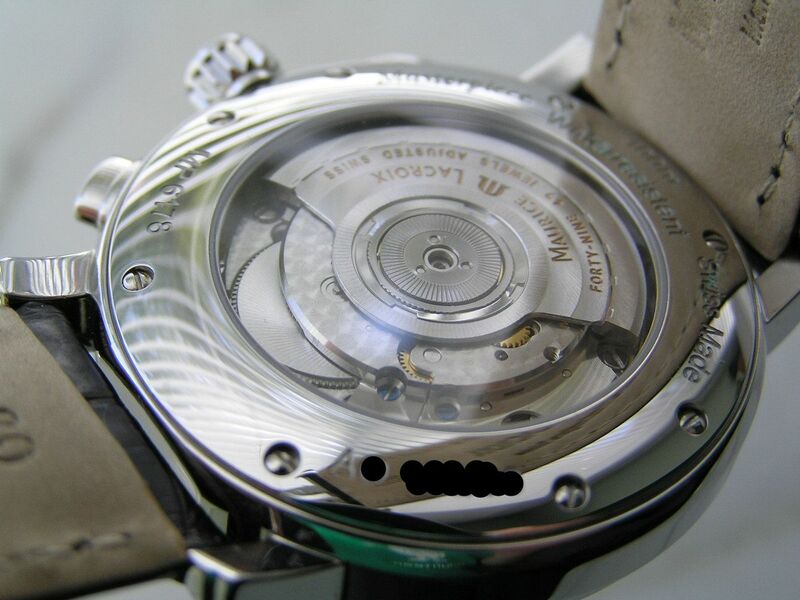 The caseback is held in place with eight small screws and features a sapphire crystal that shows off the finely decorated movement and signed rotor. 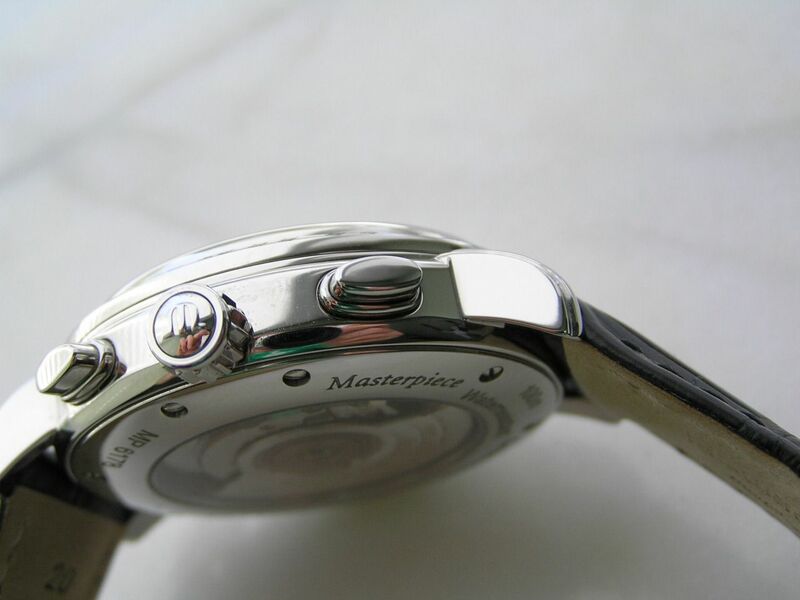 The solid part of the caseback is polished stainless and has engraving signifying this watch as part of the Masterpiece Collection, along with an exclusive serial number. 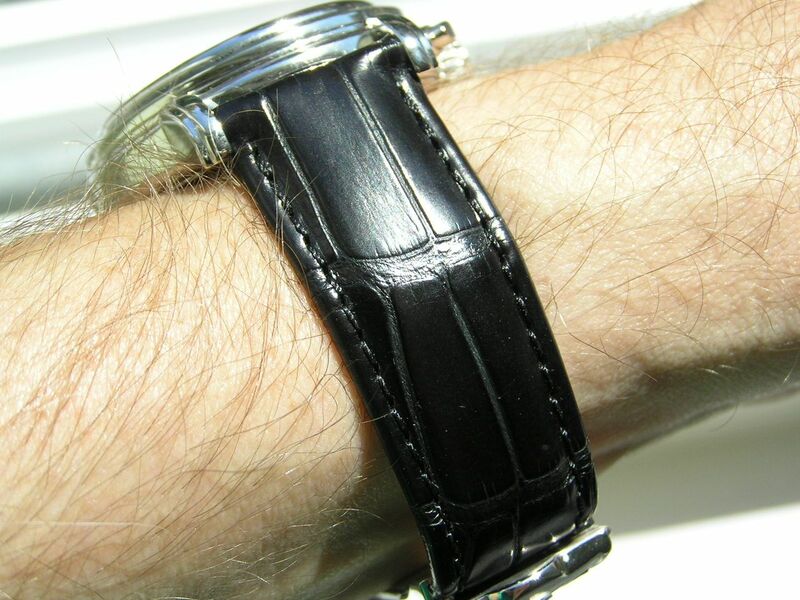 The case lugs have a stepped design and are fairly short, making this watch wear smaller than its dimensions indicate. 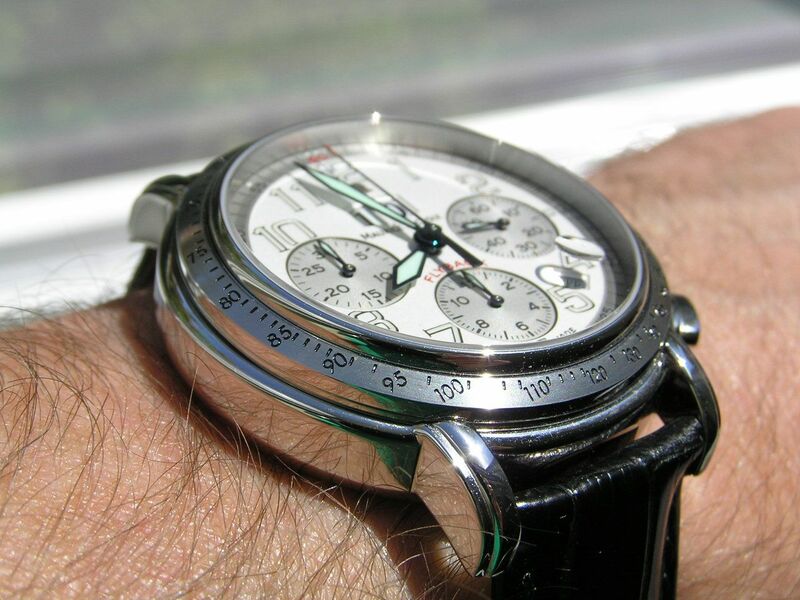 The chronograph pushers are nicely executed and are oval in shape, while the crown has fairly large knurls on it for easy time setting and re-screwing back in. A tachymeter bezel is set down from the top of the crystal and adds the appropriate amount of sportiness to this watch. It’s a watch that looks great from just about any angle. 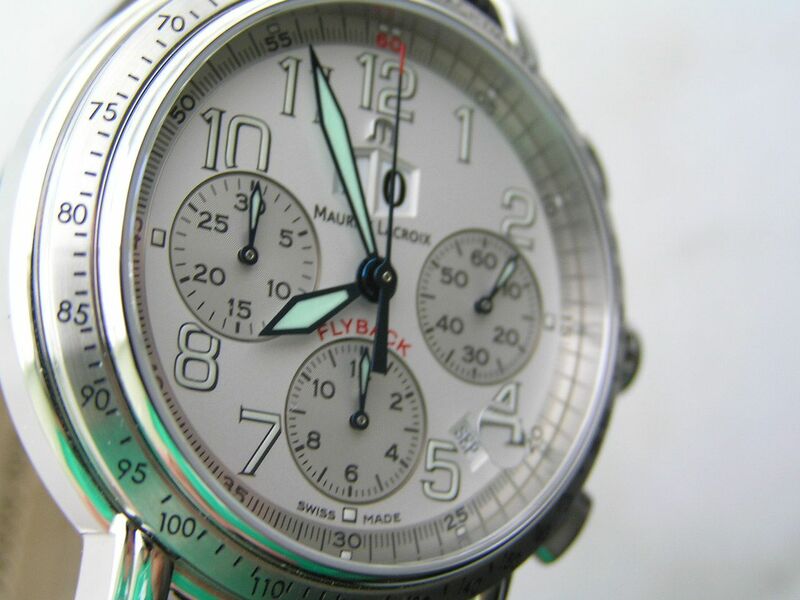 The ML Flyback Chronograph is factory rated for 100 meters of water resistance. The dial on this watch really shines. It is made of solid 925 sterling silver and has a perfect satin finish. All the hands are blued with inset lume and the printed arabics are in a vintage-style font with inset lume. 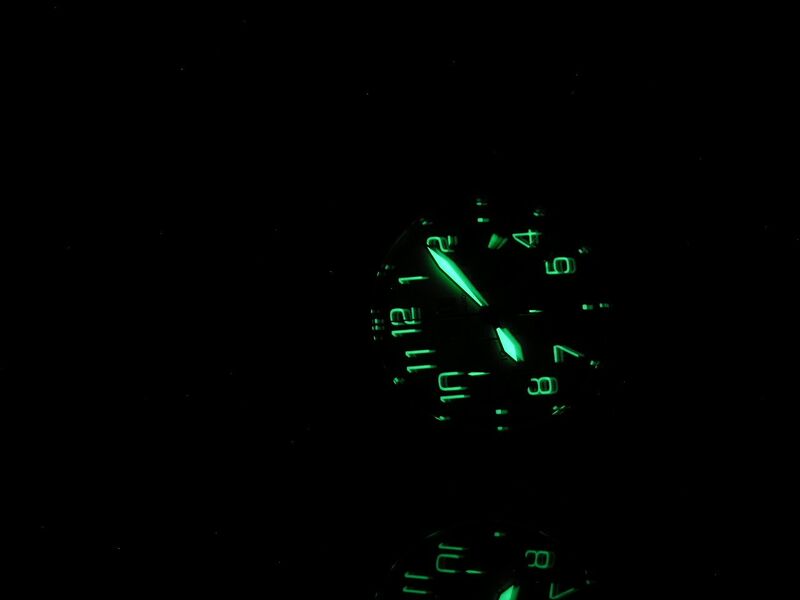 There are also small lume dots on the extreme outer edge of the chapter ring spaced every five minutes. 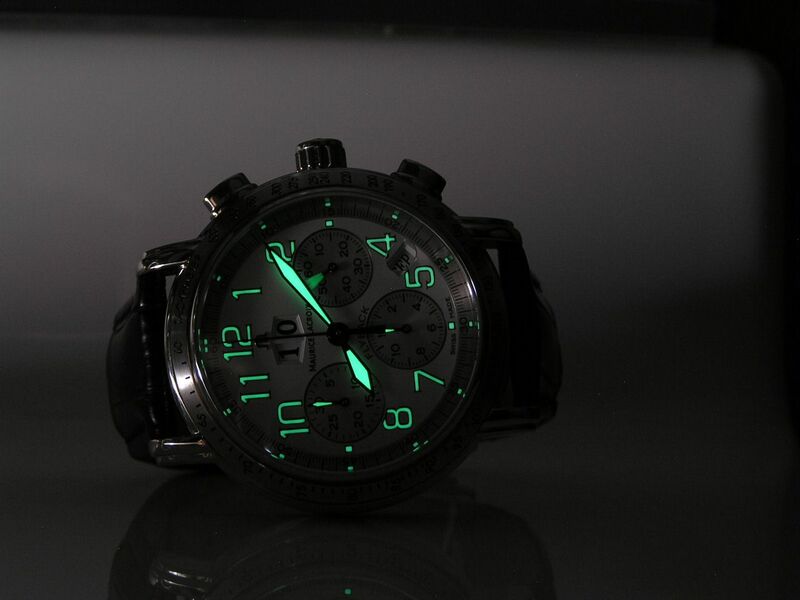 Lume quality is very good. Below the 12 position is a silver applied ‘ML’ logo and below that is the big date display. The date is displayed in two separate windows that are asymmetrically shaped. For the dates 1 through 9, the left window is blank, with the right window showing these single dates. Some big date watches, such as my Glashutte Original Sport Evolution Panoramic Date display the single dates with a ‘0’ in front of them. Either way is acceptable to me, but ML’s design looks and works just fine. Below the big date windows is the ‘Maurice Lacroix’ name in black. The month display is located at the 4:30 position on an angle and is a bit small and hard to read. An under-crystal cyclops magnifier helps enlarge the month display, but this window and wheel could be larger for easier at-a-glance reading. A small nitpick here. Alignment of the date wheels inside their respective windows and of the month wheel is good. The date is a quick set and of course changes the month automatically at either day 30 or 31. It’s actually fun watching the date wheels do their dance in the big windows and then watching the month wheel click over at the end of each month. Setting this watch is a horological pleasure. The subdials are also finished in satin silver and are ever so slightly recessed into the dial with traditional circular patterning. 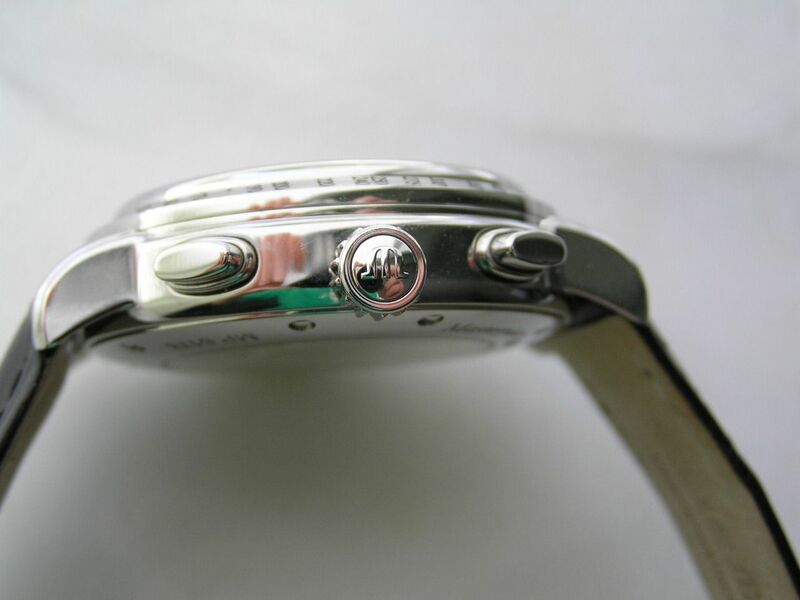 The shade of silver on the subdials is slightly darker than the silver on the dial, making them easier to read. 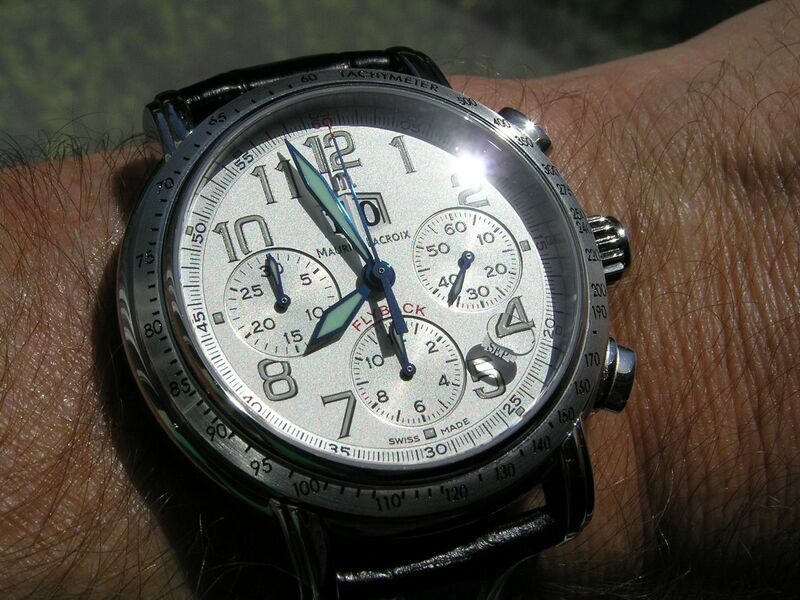 The subdial at the 3 position is the watch seconds hand, the subdial at 6 is the 12-hour chrono totalizer and the subdial at 9 is the chrono’s 30-minute totalizer. 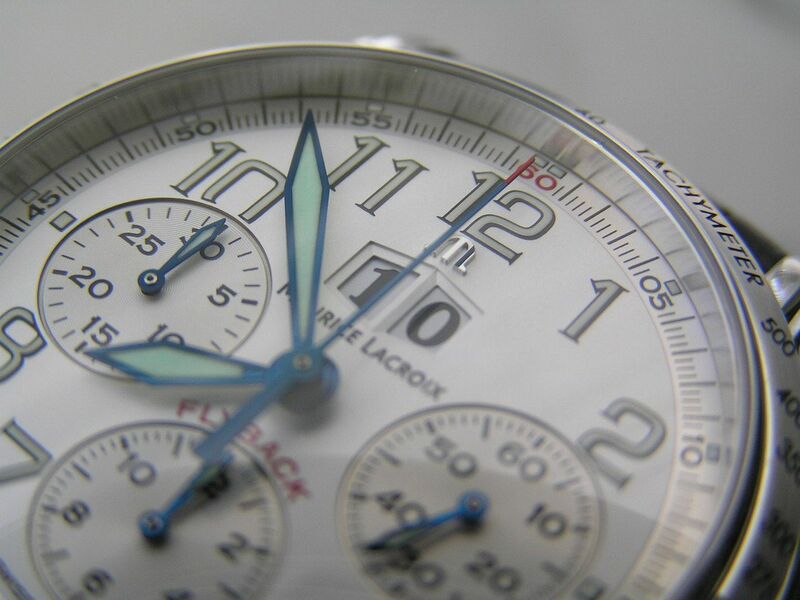 The chrono seconds hand is a simple blue stick with a red tip and below that is a red ‘60’ on the chapter ring. The chapter ring also has black arabics every five seconds, marking the seconds for the chrono seconds hand, with small black hash marks for the remainder of the chapter ring. 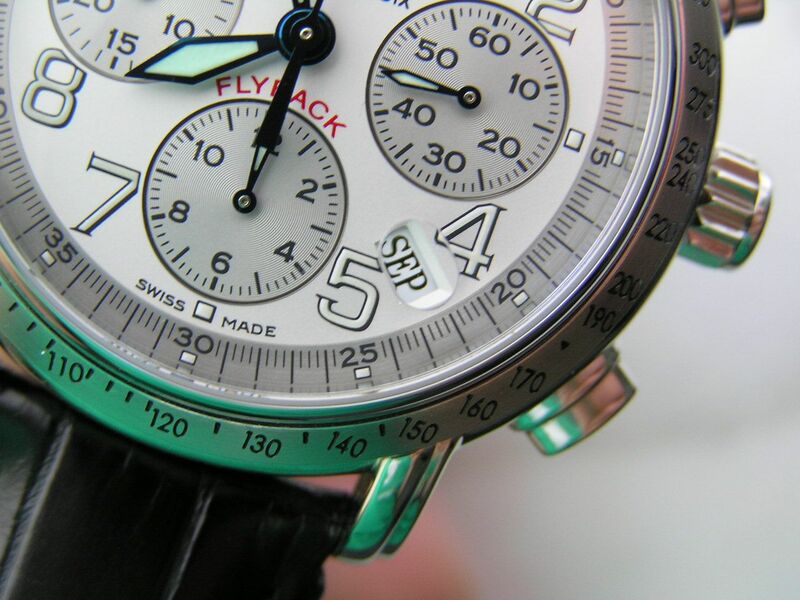 The only other red on the dial is the wording ‘flyback’ above the bottom subdial. Overall, the design of the dial is a bit vintage, a bit sporty and best of all, a stand-alone design that doesn’t copy from anybody else. The blue hour and minute hands are a cinch to read and they look fantastic. Masterpiece, indeed! Capping this lovely dial is a flat sapphire crystal without any anti-reflective coating. Overall build quality of this watch is excellent and under an 8X loupe examination, the dial is clean, the printing is clear and everything looks as it should. 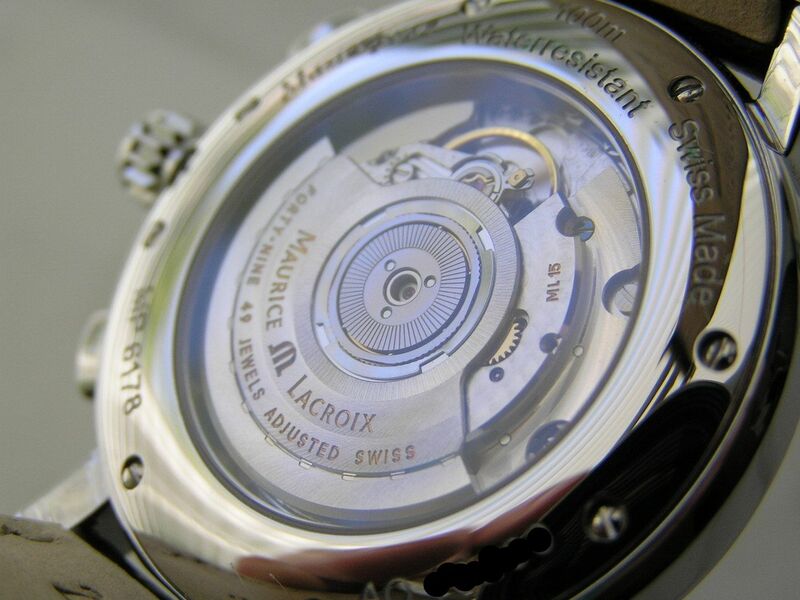 Inside the ML Flyback Chronograph is quite the mechanical marvel of a Swiss automatic movement. Maurice Lacroix calls this caliber ‘ML15’ and it starts with a base ETA 2892/A2 (itself a fine movement) and adds the popular Dubois-Depraz chronograph module. Then the craftsmen at the house of ML add another module for the big date and annual calendar functions. The total jewel count inside this ‘jewel’ of a watch is 49. Wow! Pretty cool! The movement runs at the expected 28,800 vph and also hacks and manually winds. 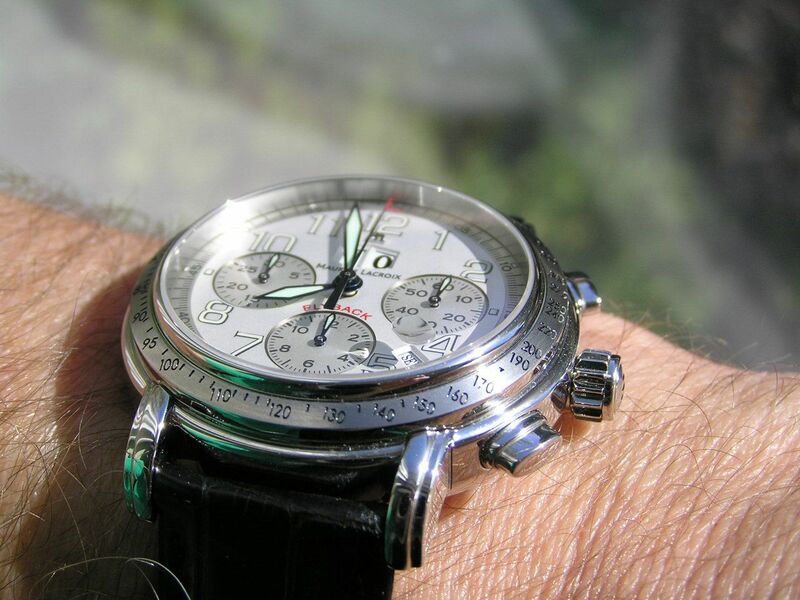 During testing in my atelier, the ML Flyback Chronograph has performed well. All the functions, from setting the date/month, to starting, stopping and flybacking the movement work flawlessly. Everything resets to zero as it should and the chrono restarts properly when the reset button is released. Winding action is smooth and silent. The only quirk I have noticed is with the big date and calendar function during quick setting. If you adjust the watch to the current date and proceed to set the time, sometimes the date will not always advance at midnight for the following day. I don’t think this is a defect, because the month always clicks over at the proper date. What I do is quickset the watch to one day behind the current date and then manually advance the watch to the proper date to assure the date clicks over at midnight, which it will do and no problems from there on. There’s just a lot of mechanical wizardry taking place inside the date mechanism with this piece, so you want to make sure to treat it right. Although ML rates the power reserve at 48 hours, I have achieved only 47 hours, but I can’t really complain. 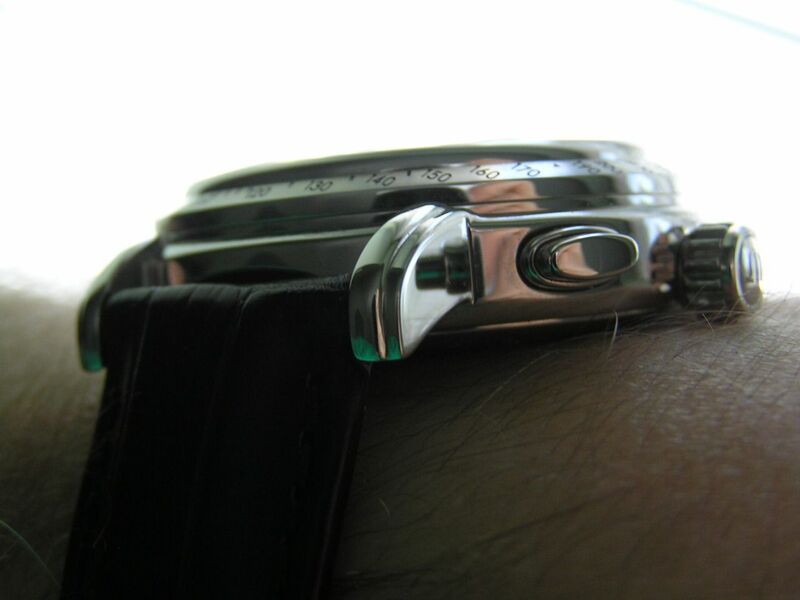 Timekeeping has averaged +3 over 24 hours, so again, I rate overall performance of this watch as excellent. 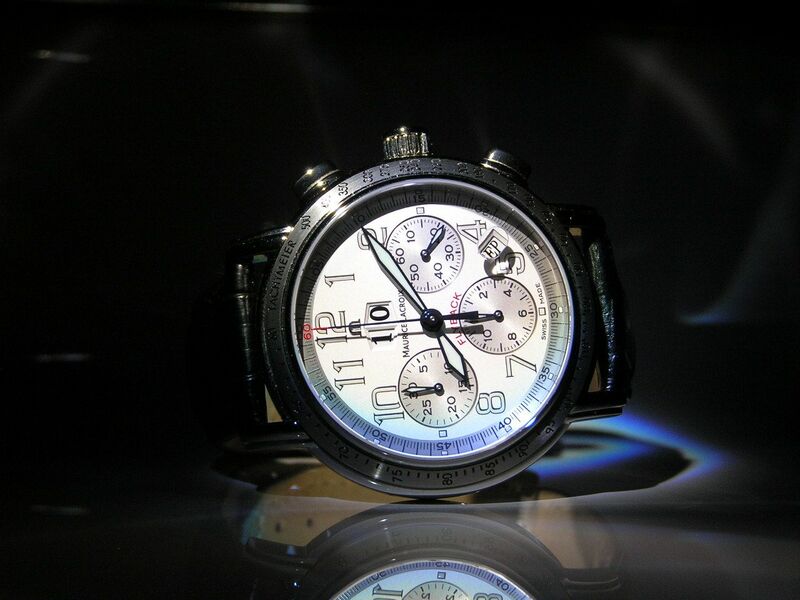 The ML Flyback Chronograph comes on a good quality black genuine alligator strap that is moderately padded. 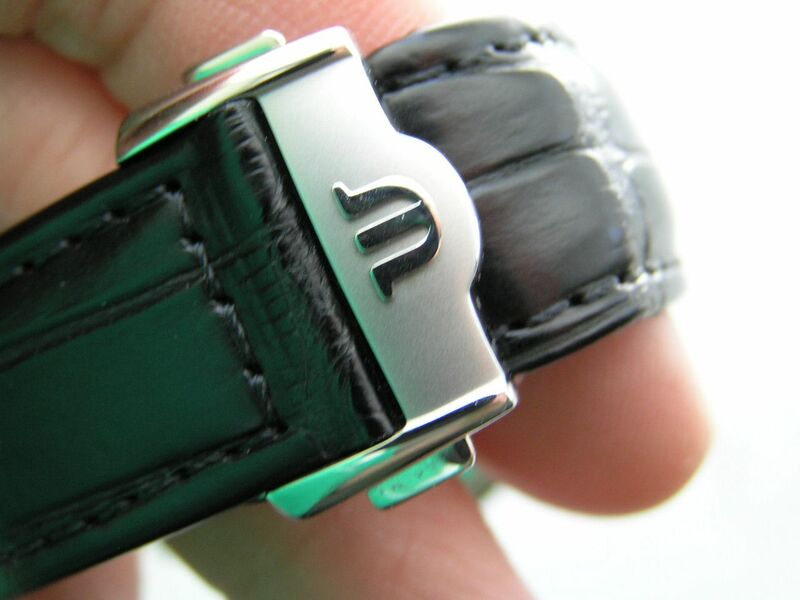 The strap has a matching black stitch and is signed on the inside. 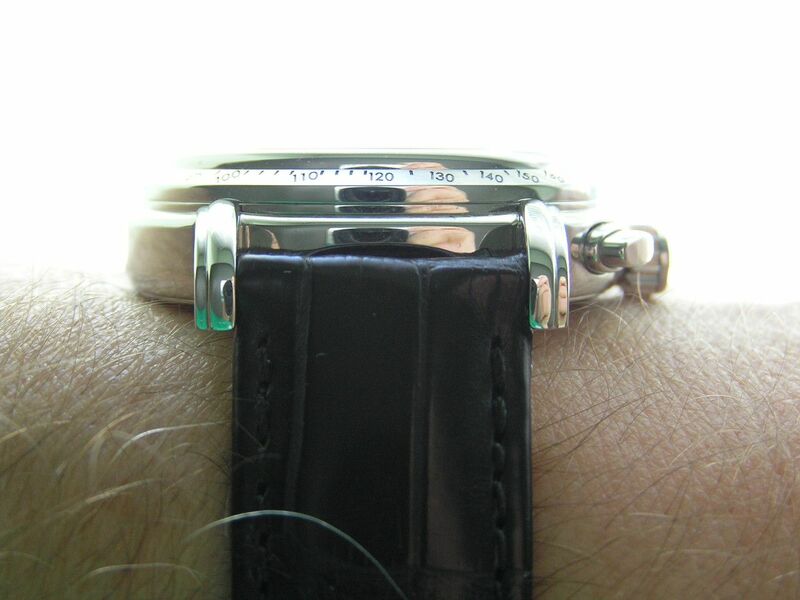 The strap measures 20mm at the lugs and tapers to 18.3mm at the deployant-style clasp. 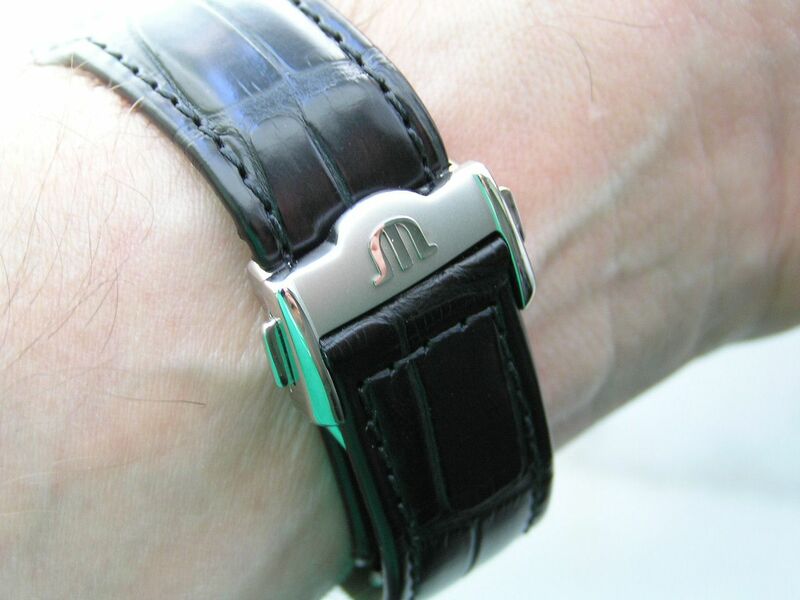 The clasp is superb, with a polished pushbutton deployant that is signed on the outside and the inside. 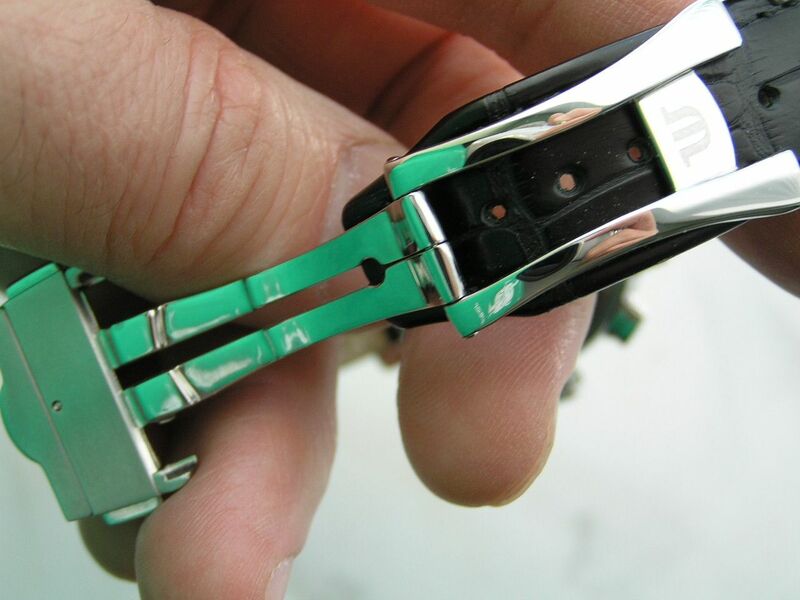 It is the type of clasp that retains the loose end of the strap inside your wrist instead of placing it on the outside of the watch, so the strap wears more like a bracelet than a traditional strap. This also gives the watch a cleaner, more upscale appearance. Presentation is ‘typical’ ML. I say ‘typical’ because all the ML watches I have owned pretty much come the same way: a large two-piece outer cardboard box and a nicely made hinged-top woodgrained plastic inner box with the watch and paperwork inside to complete the presentation. Nothing over the top nor skimpy. Just about right. 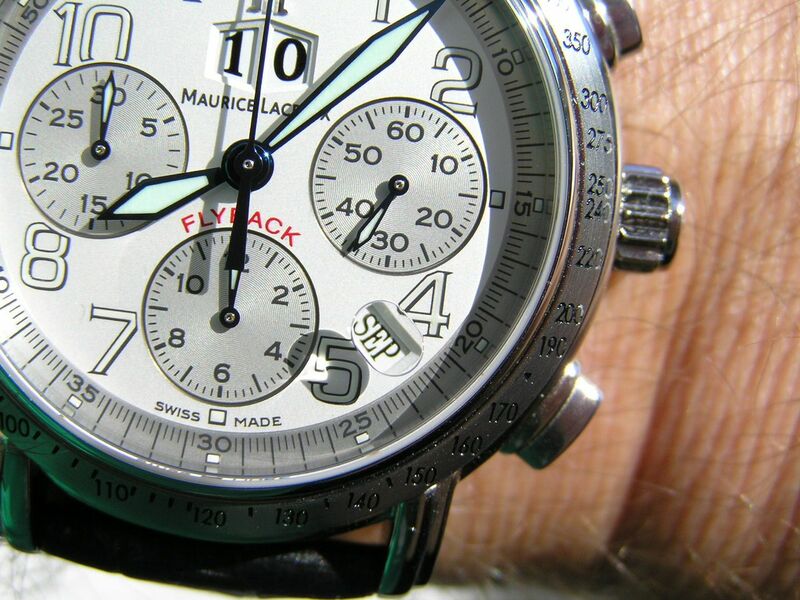 To put it simply, the Maurice Lacroix Flyback Aviator chronograph is an impressive piece of watchmaking art. If you are looking for a watch that does a lot, without looking like it does (it’s a clean, non-busy design) this is a great choice. If you want a high-quality watch with true Swiss heritage that doesn’t look like everything else out there, this is a great choice. If you want a complicated piece of mechanical movement craftsmanship at a discounted price, this is a great choice. 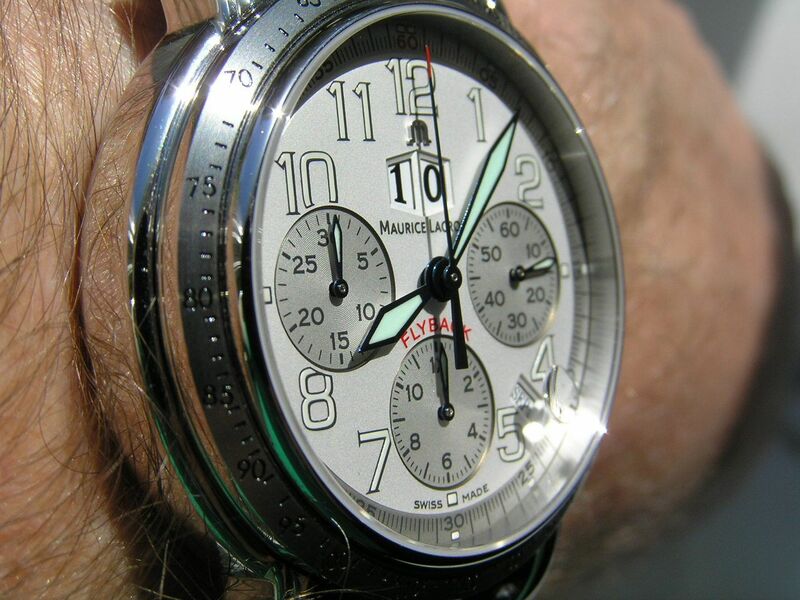 Pretty much anyway you slice it, the ML Flyback Chronograph is an amazing watch. Verdict: a superb watch with nifty features that is highly wearable, even as a daily driver. It’s called a ‘Masterpiece’ for a reason.